If, and when, a serious emergency or disaster strikes there are some things that will disappear forever or be really hard to come by. Some of these items you are going to want to get NOW because after an emergency they will be impossible to get. If you search online you will find plenty of lists that give you all of these items that will be gone, but some of these things you might miss, but you can live without. Here are the 15 things that you want to have on hand now. Fuels – Lantern fuel, lighter fluid, propane, and, of course, gasoline will all go away and they will be hard to find quickly. When a natural disaster comes these types of fuel tend to fly off of the shelves. Guns and Ammo – Guns and ammunition are made on big machines and when the world changes this type of automation will no longer be available. Get it while you can. Can Openers – This might seem like a silly item to list, but a can opener can do a lot for your convenience. A multi-tool could also be listed here. Foods – Many food varieties would change, especially depending on your location, but things like wheat, rice, beans, cooking oil, honey, and white sugar would be gone for a very long time maybe forever. Hygiene Products – This is a big one. Soap, feminine hygiene products, shampoo, shaving cream, razors, toothpaste, toothbrushes, toilet paper, and so on, would all disappear and no matter how much you stockpile, eventually it will go away. Aluminum Foil – This is a product that can do a lot for you when it comes to cooking. Foil can be a cooking surface if need be. Paper Products – It bears being mentioned again, but toilet paper, paper towels, paper, books, and so on would all go away. 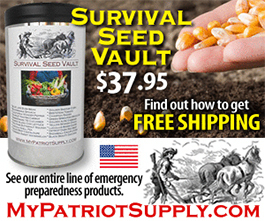 Seeds – Heirloom seeds are invaluable and you should be stockpiling them now. Make sure that you practice growing the seeds that you save because practice makes perfect. Fire Extinguishers – The fire department won’t be a phone call away. Having the means to take care of an emergency situation will be important. Batteries – Being able to use electronic devices will be important. The more batteries, in different sizes, that you can save the better. Matches – Being able to light a fire will be imperative. Matches won’t last forever, but when used properly they can last a long time. Duct Tape – This is an item that can solve so many problems. You might not need duct tape forever, but it can help you out in a pinch. Cleaning Products – Things like bleach, vinegar, and laundry soap will go away. These different cleaning products can go a long way. Medication – Any medication that you need, you won’t have. Being able to save up on important medication and stock pile over the counter meds will be important to survival. Liquor – This is important for more than just having a good time. Liquor can also be used as a cleanser and to help with pain relief. Yes, there are dozens, if not hundreds, of other things that will disappear forever in a serious disaster, but many of these things we can learn to live without and many of these things we will learn how to make again. Yes, milk will go away, but this will only be temporary and if you have livestock it might not happen at all.